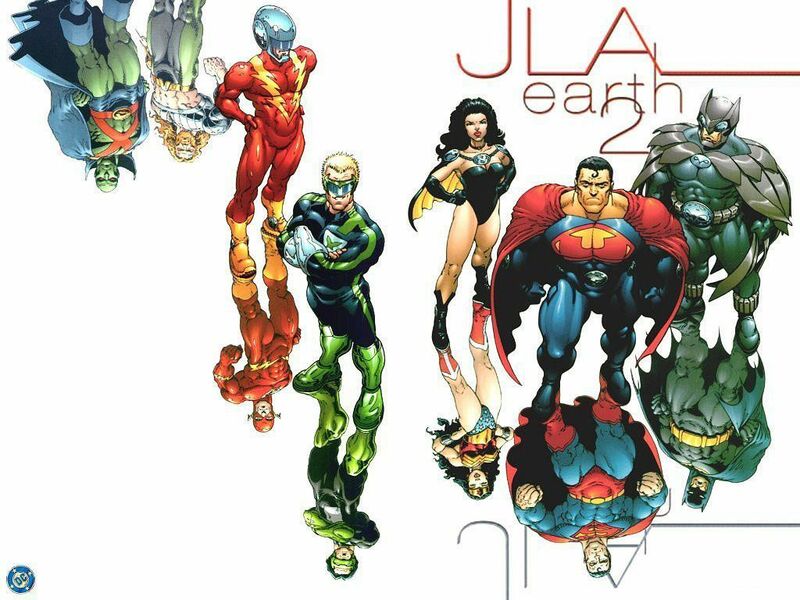 I picked up a re-release of, "JLA: Earth 2," written by Grant Morrison and illustrated by Frank Quietly. I don't have a true review to offer so much as various random thoughts, observations, and opinions. A world full of villains with a single hero in the form of Alexander Luthor is both a sad-sounding place and a fascinating one. To balance out the scales of reality or whatever the Crime Syndicate of Amerika gets to go to the Justice League's world and cause a ton of havoc that we see the after-effects and clean-up of. Considering how these people look quite a bit like the Justice League wouldn't people kind of be freaked out that their heroes had turned on them, sort of in the same way people in the opposite-world had immense trouble believing these apparently-new-but-looking-just-like-the-Crime-Syndicate-folk were there to help? 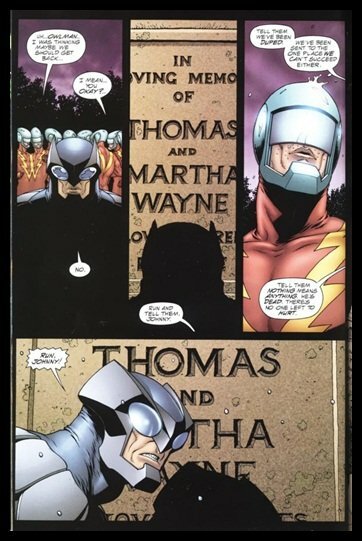 I guess the Justice League just was able to say, "Those were other versions of us," and everyone was cool with it. I cracked a smile at the "normal" DC Universe's earth being termed, "Earth 2," because the other-world's Luthor thinks of ours as the, "other Universe," which is a clever twist on how things are usually the opposite way around. That's a bit of a meta-fictional reversal, right there. It's a Earth where a lot of stuff is opposite, but not everything...some things are just strangely changed. I wouldn't let this bother me but Morrison tries to say how everything is in reverse--such as people's hearts being on the other side of their body or the UK having tried to gain independence from America in a clever switch--but then does things such as having Lois Lane be Superwoman (the evil Wonder Woman), or have there be no evil Aquaman (the lack of Martian Manhunter is addressed though), or how Owlman (the evil Batman) and Superwoman are hooking up...although now that Superman and Wonder Woman have a thing going as of later in 2012 I guess that is kind of the reverse and predicted what would happen. Frank Quietly's art is always a pleasure to look at. Seeing the evil-version of The Flash with his drug problem cracked me up knowing about the whole story of Green Arrow's side-kick Speedy developing a drug problem all those years ago (although really, wouldn't a nickname like, "Speedy," tip you off there could be an issue? ), that was clever. 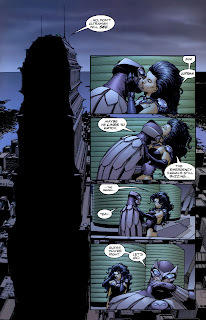 I think Batman was right in saying the Justice League had no business going to Luthor's dimension. "We're not an inter-dimensional police force," is a wise way of putting it. Still, because the majority of Justice Leaguers think its a good idea to help Batman goes along anyway...and probably feels vindicated to see things go horribly wrong. I liked the idea that both both the heroes and their villainous counterparts found a earth where they couldn't, "win," due to it being just the way the world is. The story moves along at a pretty brisk pace. In this era of comics being super-decompressed this is actually a story that I think might have been even better with a bit more space to breathe--make it a third longer and the characters could have been fleshed out more, perhaps. knowing about the whole story of Flash's side-kick Speedy developing a drug problem all those years ago"
You'd better tell Green Arrow, then. Crap. I'd love to say that was a typo but I honestly forgot for a second that he was with Green Arrow and in my late-night confusion thought Speedy was Flash's sidekick. I have corrected it but shall keep your comment up as you totally got me.